Very natural look at the top of the style. The top has each fiber/hair hand sewn so it gives the illusion of hair growing from the scalp. Is more expensive than a wefted style. Monofilaments with a lace front are a very nice combination. You don't need bangs to cover the front of the style and you have a natural top. Less expensive than a monofilament or hand-tied style. A wefted style dosen't allow you to put a definite part in the wig without seeing down to the cap. Will be warmer in the summertime. If you like 'big hair' a wefted top has a lot more hair at the top than a monofilament top. A lace front allows you to pull the fiber/hair off of your face and still give a natural look at the hairline. Some skin tones need makeup on the lace to help blend the lace front with their skin tone. If you have extremely sensitive skin the lace from some manufacturers might bother you. Most premium monofilaments and hand-tied wigs have the lacefront feature also. Each fiber/hair is sewn in by hand throughout the entire style for a very natural look at the scalp. A very light weight cap! Hand-tied styles call for a premium price due to the amount of labor it takes to make these styles. There is less overall density in a hand-tied style. Works well for someone that isn't used to a lot of hair. 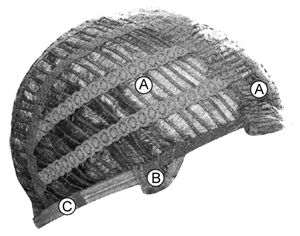 The first thing one should learn about wigs is that there are different cap constructions. The cap construction is something important to keep in mind when choosing your style. Just like wig colors and styles, you also have different cap constructions to select from. 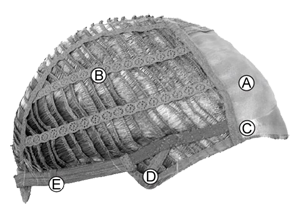 The wig cap is what the hair, synthetic or human, is attached to in creating a style. Wig caps have become more comfortable over the years and the manufactures have become better at creating the perfect cap. The wig caps described here might have slight differences depending on the supplier. Overall, these are very good descriptions, and give you an education on cap construction. Monofilament caps offer the illusion that the hair is growing from the scalp when parted. Each strand is hand-tied to a transparent base. The cap is perfect for parting the hair and has styling versatility. Some monofilaments have a single mono or double mono. Some wig wearers like the double mono as they think it is softer (think of 2-ply vs. 1-ply); however, some women like the single mono as they think it is cooler. BUT monofilament crown will allow for the parting to be changed and does not show the teasing of a classic/wefted wig. The OPEN CAP area allows for ventilation and the POLY STRIP can be used for tape or adhesive if needed. Some, but not all, monotops have this poly strip feature. The EAR Tabs show you where to position the style on your head. ADJUSTABLE STRAPS allow the circumference to be adjusted in size. Lace front wigs have a natural looking front hairline where each hair is hand-tied to the lace section along the front hairline. This allows the wig to be styled away from the face. However, the lace is a little more delicate than the rest of the cap. It will need to be handled with care. Actually the best way to deal with it is to handle it as little as possible. In other words try not to put your fingers under it to adjust it. Grab a bunch of fibers in the wig to move it forward or back on your head. The OPEN CAP allows for cooling ventilation. The EAR Tabs show you where to position the style on your head. ADJUSTABLE STRAPS allow the circumference to be adjusted in size. The mono part allows for a natural look in the part area. The strands are individually sewn in this area to give a natural look when parted. It gives the luxury of a mono top with a lower retail price. The OPEN CAP allows for cooling ventilation. The EAR Tabs show you where to position the style on your head. ADJUSTABLE STRAPS allow the circumference to be adjusted in size. The MONOFILAMENT and LACE FRONT portion of this cap are transparent giving a very natural look. The hair looks like it is growing out of the scalp. The LACE FRONT looks very natural and at the hairline each hair is hand tied one by one. 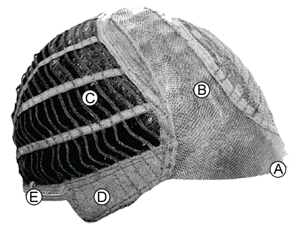 The OPEN CAP allows for ventilation. The EAR Tabs show you where to position the style on your head. ADJUSTABLE STRAPS allow the circumference to be adjusted in size. This cap is very natural looking all the way around. It has a transparent base throughout most of the cap. Without the wefts it makes for a very light weight cap design. This design also has less hair overall which makes a very natural look. The EAR Tabs show you where to position the style on your head. ADJUSTABLE STRAPS allow the circumference to be adjusted in size. The Monofilament gives the illusion of hair growing right out of the scalp. The Hand Tied body of the cap completes the look as each hair is individually hand tied and moves very naturally. Without the wefts it makes for a very light weight cap design. This design also has less hair overall which makes a very natural look. 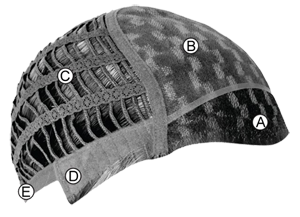 Each hair on this design of cap is carefully hand-tied and is the preferred cap by those who have a sensitive scalp or hair loss. A quality HAND TIED cap is the most comfortable and softest cap on the market. The EAR Tabs show you where to position the style on your head. ADJUSTABLE STRAPS allow the circumference to be adjusted in size. Open cap wigs are often referred to as wefted or traditional. 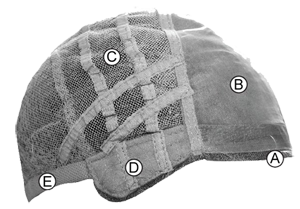 Some are referred to as capless because there are no solid areas of fabric on the cap. Older styles of wigs used to have a lot of fabric. The open cap was a revolution as most quality wefted wigs are lighter and cooled than they used to be. 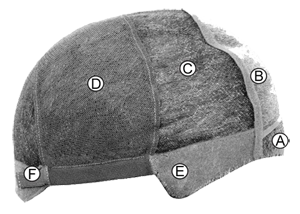 This type of cap is less expensive because it has machine made rows of fabric that the fiber/hair is sewn onto. This is how wigs used to all be manufactured. 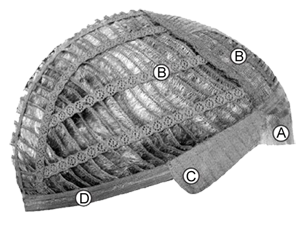 The disadvantage is that there is more density at the top of the style because the fibers need to cover the fabric cap. This prevents you from having a natural looking part in the hair. At the base of the strands of hair there is perma tease and you need to keep it loose (not a definite part) so that this doesn’t show. It is frizzy fiber to fill in so that you don’t see through to the cap at the top. The EAR Tabs show you where to position the style on your head. ADJUSTABLE STRAPS allow the circumference to be adjusted in size.